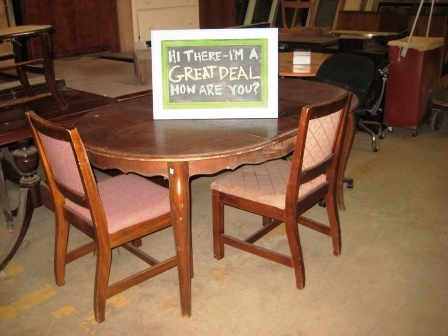 Home » Antiques & Vintage » Mid-Week Flash Sale: furniture & “orphan” cabinets! Mid-Week Flash Sale: furniture & “orphan” cabinets! To get ready for our big Garden Party this Saturday, we’re trying to make some room. So, it’s your chance to pick up some great deals! 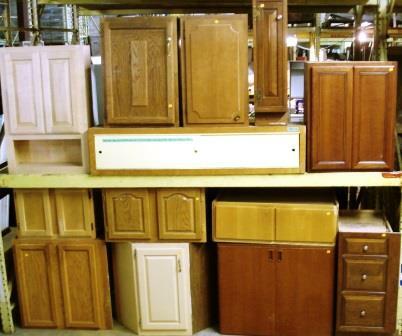 Save 50% on Orphan Kitchen Cabinets, Doors, and Drawers! Take half off the marked price on kitchen cabinets that are not part of sets, as well as individual cabinet doors & drawers. Sale does not apply to other types of furniture, decor, or doors; select specialty items; hardware; bathroom vanities, medicine cabinets, or living room cabinetry; cabinet sets; items with missing or damaged price tags, or items from our consignment partners. 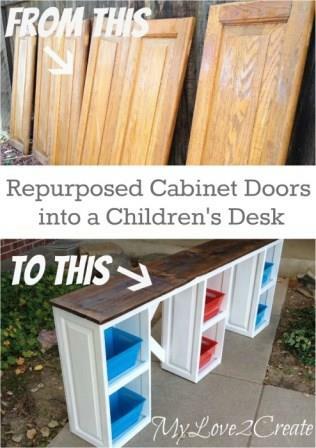 These are great for upcycling projects! People often make chalkboards, serving trays, hook strips, and jewelry organizers out of orphan cabinet doors. The best one we’ve seen recently is this kids desk, from My Repurposed Life – click the picture to jump to the tutorial! Save 50% on Orange-Tag Furniture! This Wednesday & Thursday, take half off orange price tags on desks, chairs, dressers, tables, bed frames, TV consoles, wardrobes, bookshelves, file cabinets, housewares, and framed art. Some exclusions apply. Sale does not include blue-tag or white-tag items, select specialty items, built-in fixtures such as vanities or cabinetry, architectural salvage, or mantles. Sale does not include items from our consignment partners, or items with missing or damaged price tags. And, check out our markdowns on Blue-Tag Furniture! While you’re here at the warehouse, take a closer look at our vintage blue-tag furniture – we’ve recently marked down many of our unusual and antique items.